Following Anderson Silva's gruesome injury and loss Saturday night at UFC 168, the UFC released a statement about the former champion's emergency surgery in Nevada and future. "Following Saturday evening's UFC 168 main event, former champion Anderson Silva was taken to a local Las Vegas hospital where he underwent surgery to repair a broken left leg," read the statement. "The successful surgery, performed by Dr. Steven Sanders, the UFC's orthopedic surgeon, inserted an intramedullary rod into Anderson's left tibia. "The broken fibula was stabilized and does not require a separate surgery. Anderson will remain in the hospital for a short while, but no additional surgery is scheduled at this time." At the UFC 168 post-event press conference, UFC president Dana White said he had not and would not speak with Silva regarding whether or not he would retire or attempt a come back. According to White, it simply is not the right time and all that matters is that "The Spider" heal and get healthy for himself and his family. "I don't want to count him out, I don't want to count him in. It's just really not the important thing right now. The important thing is he gets his surgery, heals up and then we go from there," White said. The UFC's statement on Silva went on to describe the typical recovery time for the injuries the fighter sustained from getting a leg kick checked by Weidman. 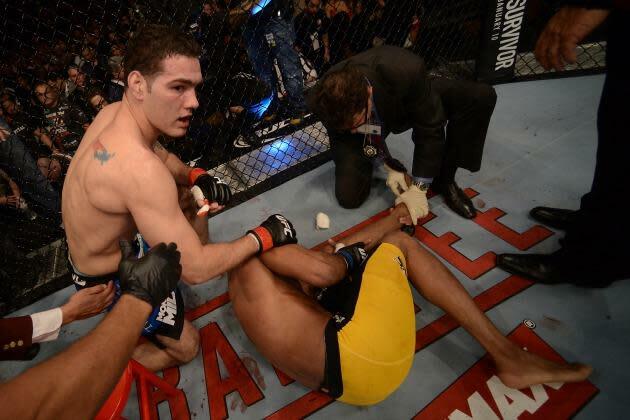 "Recovery time for such injuries may vary between three and six months," according to the UFC. The statement also asked that Silva be granted "privacy at this time," and said that he had not made a decision on whether or not he would ever fight again. For his part, Weidman now appears to face the prospect of fighting former UFC heavyweight tournament champion and former light heavyweight champion Vitor Belfort. Belfort has won three fights by KO in 2013 and White has said he's at the front of the contender's line. Belfort spoke up during the post-fight press conference and politely made sure his name stayed in everyone's mouth as the next challenger to Weidman. Though the champion seemed unfazed by the prospect, he did say that he will have to take a few weeks to see where he's at because, he believed, he may have a torn meniscus in one of his knees.